A £1million boost was announced today for a ground-breaking initiative by University of Ulster scientists and Randox Laboratories that aims to bring relief to people with severe rheumatoid arthritis and save the health service millions of pounds each year. 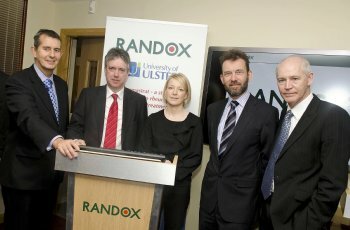 Ulster’s Biomedical Sciences Research Institute and clinical diagnostics company Randox are collaboratingon the developmentof a simple personalised test that should enable life-changing drug treatment to be tailored to the needs of individual suffers of the chronic inflammatory disease. Fifty percent of this funding has been awarded through the UK-wide Technology Strategy Board and the Medical Research Council, and will be matched by funding from Randox.The initiative will help to place Randox and the University of Ulster in front-line in developments in personalised medicine. Professor Tony Bjourson Director of Biomedical Sciences Research Institute said: “This is a personalised medicine project that really is a fantastic example of the benefits for all concerned when University of Ulster biomedical scientists and a highly innovative company such as Randox work together. The partners are working on development of a simple blood test to match “responder” patients to new advanced “biologic” drugs, costing up to per £10,000 per patient per year. By also indentifying “non-responders”, the test will mean an end to futile periods of therapy for the sizeable proportion of patients who at present undergo the costly drug treatment without deriving any benefit from it. Dr Cathy McGeough, a Research Associate in Stratified Medicine at Ulster’s School of Biomedical Science, who spoke about the impact of rheumatic arthritis on both patients and the economy, said 20,000 people in Northern Ireland are affected by it. The condition costs the NHS an estimated £560 million annually. Around580,000 adults in England currently have the disease with a further 26,000 new cases diagnosed each year.The estimated cost to the economy of sick leave and work-related disability for people with rheumatoid arthritis is £1.8 billion a year. About 10% of sufferers do not respond to standard drug treatments for rheumatoid arthritis. They are then eligible for expensive biologic drugs such as antibodies to TNFa (Tumour Necrosis Factor-alpha). They combat the effects of joint inflammation by copying the effects of substances naturally made by the body's immune system. This treatment is effective in about two-thirds of those who receive it but the remaining one-third or more fail to benefit from it. Current application of the drugs in a trial and error fashion, without any advance indication of which patients may be most receptive to them, results in time consuming inconvenience for “non responders” and a waste of valuable resources. Clinical studies will be conducted in co-operation with volunteer patients in two health trust areas, the Belfast and Western Trusts, and the translational medicine facility C-TRIC, which is based at the Altnagelvin Area Hospital site. Dr Martin Crockard, Project manager at Randox, said the company was delighted to be working with Professor Bjourson and his team at Ulster on the development of a groundbreaking test that aimed to improve care for rheumatoid arthritis patients. Consultant Rheumatologist Dr Philip Gardiner, who is one of the consultants involved in the project, said: “The biologic drugs available to us make it possible to effectively treat people whose lives have been devastated by severe inflammatory arthritis and restore a good quality of life.